There is power in the Name of the Lord Jesus Christ! As believers we must know the necessity of calling on that great Name. Trouble comes...Jesus! Worrisome report from the doctor...Jesus! Disappointments...Jesus! His Name is a Mighty Fortress! The righteous run into it and are safe! His Name is above every name! Every circumstance, every condition! Life is full of detours. Detours require that we attempt to reach a goal in a round about way. 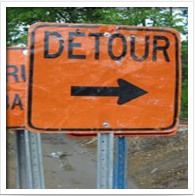 Detours are seen when we must deviate from our regular route when driving. Some drivers get a “trip-tik” for navigation to warn of construction sites and to provide alternate routes. At times, even though we see the orange barrels and cones, which cause us some discomfort, we still may proceed to follow what WE perceive is the best course to follow. On some highways, traffic can come to a complete and absolute standstill. A short journey, because of detours and delays, can become long and stressful. Travelers often encounter delays at the airport that can require hours of layovers, even sleeping all night in the airport. Even the signs which say, “Please excuse our dust/progress…” do little to quell the anger and frustration of being delayed or forced to detour. Sometimes the path that we are on in life suddenly, without warning, shuts down. It is then that we must realize that, even in the detour, Jesus is still on the throne…still working things out all right on the behalf of those who trust in Him. Life does NOT move in a straight line ALL the time for ANYONE! All of us come up against “stuff.” Jesus told us in the world we would HAVE tribulation…but to be of good cheer for He has already OVERCOME the world! Along this journey, with Jesus, we are able to maneuver through the curves and make it through any unexpected detours. While driving through Pennsylvania and West Virginia it becomes necessary to drive through long tunnels. Some are so long that you cannot see the entrance or the exit. However, it is important to keep moving and keep believing that you will come out all right. The mind could begin to fret and fear running out of gas, being overcome by fumes, having a car break down, or a cave-in in the tunnel. But…nobody likes a whiner or a complainer. No matter how carefully we plan our journey there will be unexpected obstacles. James 1:2 reminds the believer that trials can strengthen our faith. Therefore troubles can be our “friends.” Once we survive one detour, we have more knowledge to remember that new detours will not shake us as much. The visibly blessed are moving targets for enemies. Blessed people must develop crocodile skin not to be wounded so easily. Very successful people are envied by jealous people. By continually trusting in God, however, our enemies will still have to see us seated at the table of blessing for God will ALWAYS make a way for us. Every time an enemy tries to take us down, God always steps in on behalf of His people. Detours also allow us to see places and opportunities that we would NOT have seen…were it not for the detour. In retrospect, things that we thought would be so terrible ended up being a blessing. Even people who dropped out of our lives, we later see why even their leaving our lives was for our good. Even things we thought would be a blessing can turn out to be a curse. We are all uniquely qualified to do something specific that the Lord wants us to do. It is important for us to be patient as the Lord develops the gifts within us. When trouble comes, we may fall down, we may tremble, we may cry for a while…but not for long for we KNOW God WILL make a way for us! The detours we encounter in this life provide God the opportunity to show us new ways He intends to bless us!